Sweden is one of a handful of countries where the international arbitral process has reached a stage where the jurisprudence is replete with instances involving no local parties at all. Due in all likelihood to this context of especially credible neutrality, the Stockholm Chamber of Commerce (SCC) has emerged as a leading global arbitral institution. Whether the matter at issue is a business transaction dispute or a politicized conflict involving obdurate parties, the richness of its body of decided cases manifests the SCC’s authority and reliability throughout the converging world of international arbitration. In addition, readers will be exposed to a trove of pertinent references to important dispositions that have in recent decades been generated by the stream of major international arbitrations conducted in Sweden. Disputing parties wishing to know what will happen when their case is brought to Sweden for arbitration will find no clearer or more thorough guide. 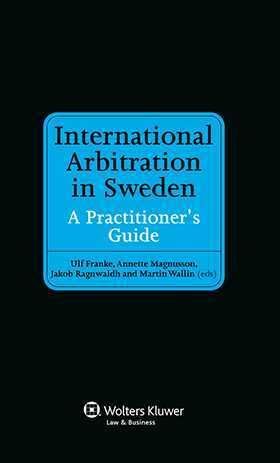 This book is an incomparable source for anyone called upon to act as arbitrator or counsel, or in any other capacity, in an international arbitration in Sweden. Foreword: An Introduction from an Outside Perspective; J. Paulsson. Chapter 1. Fundamental Principles of International Arbitration in Sweden. Chapter 2 . Stockholm as a Forum for Investment Arbitration. Chapter 3. The Arbitration Agreement. Chapter 4. Jurisdiction of the Arbitral Tribunal. Chapter 9. Recourse to the Courts against an Arbitral Award. Chapter 10 . Application of New York Convention by Swedish Courts. APPENDIX I The Swedish Arbitration Act of 1999. APPENDIX II Arbitration Rules of the Arbitration Institute of the Stockholm Chamber of Commerce. APPENDIX III Rules for Expedited Arbitrations of the Arbitration Institute of the Stockholm Chamber of Commerce. Bibliography. How to Access Swedish Legal Authorities.